ENDOR™ Dermatitis Care contains natural anti-inflammatory compounds, such as: Curcumin, Vitamin C, Vitamin A, Vitamin E, and Fish Oil rich in Omega 3. These ingredients may help to reduce inflammation in dermal conditions such as: itchy flaky white capped skin, eczema & rosacea. ENDOR™ Dermatitis Care is to be used in conjunction with ENDOR™ Cream, ENDOR™ 3.5 and ENDOR ™ Rosacea Cream, which is under development. These topical creams are to be applied on the lesions and locally affect the healing process (from outside in). The capsules are to help manage the condition (from Inside out). Recommended Daily Dose: Adults: 2 capsules daily – 1 in the morning and 1 at night. Children: 1 capsule daily. We recommend that you take 4 capsules per day, 2 in the morning and 2 at night for the first 10 days of first usage or when you have a flare-up. For maintenance, take 2 capsules per day, one in the morning and one at night. Children from 9 – 16 years of age, can take 2 capsules per day for the first 10 days or when they have a flare-up and then one capsule per day for maintenance (either morning or at night). It is very important that you continue taking the capsules for maintenance. The capsules are coated in a way that they do not dissolve in the stomach, therefore protecting the ingredients from being digested by the stomach acids and enzymes. These capsules cannot be cut or pierced in any way, as this will expose the contents to the stomach acids. 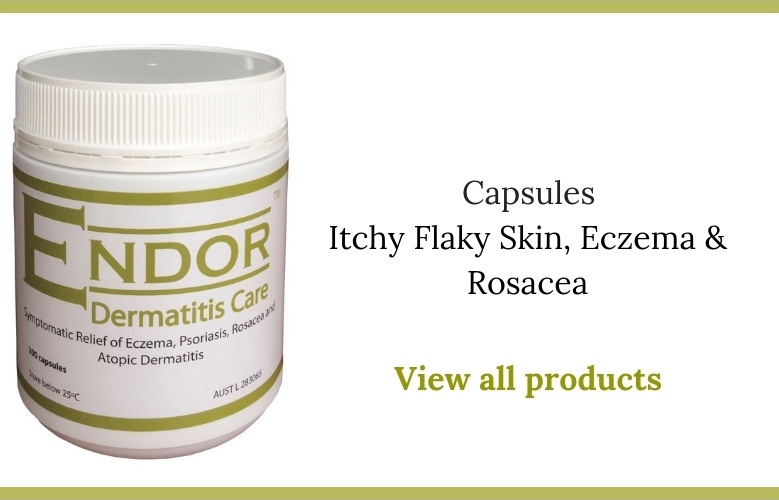 In our blog you can find the list of FAQ about ENDOR™ Dermatitis Care. Please click here to read it.